Last week I asked: What is the world’s largest manmade object? 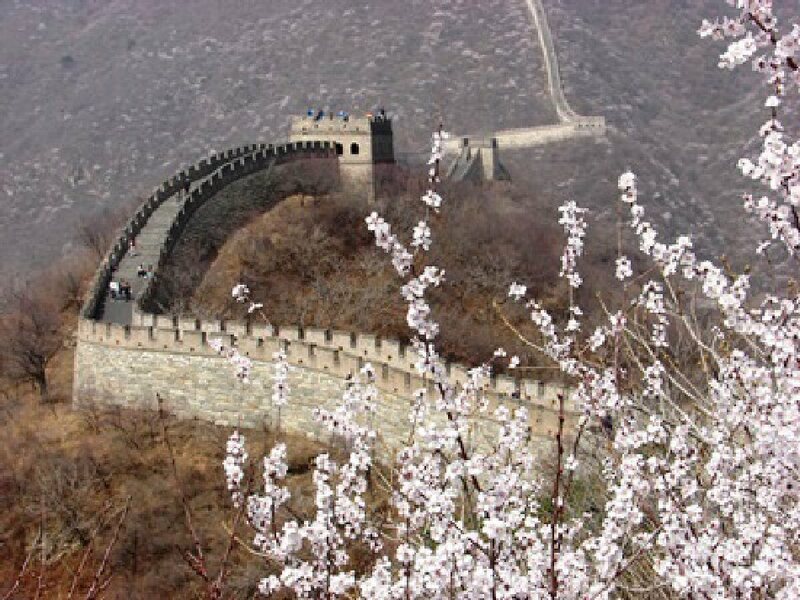 The Great Wall of China is not a continuous wall, but a number of sections built over a long period of time. If all the sections are included in the length it would span about 13,600 miles. There are conflicting reports on whether or not the wall was seen from the Moon with most people saying it was not. The wall, while massive, is a long thin line. We visited the Great Wall on our first trip in the 1990s. On our recent visit to Beijing John and I decided to visit a different section of the wall. The Mutianyu section is touted as less visited than the Badaling section. 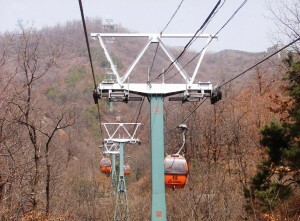 The Mutianyu section had a cable car which I thought would eliminate a lot of climbing. We booked an English-speaking day tour with Gray Line. It was a drizzly day with low clouds, so when we got to the first stop which was the Olympic Village the views of the Bird’s Nest and Water Cube, the iconic buildings used during the Olympics, were underwhelming. I thought the experience at the wall was going to be a big disappointment because of the weather but when we arrived at Mutianyu the skies had cleared and the weather was beautiful. I thought the presence of a cable car meant no walking and no stairs. From the parking lot it was an uphill climb past vendors and then some stairs to the cable car. 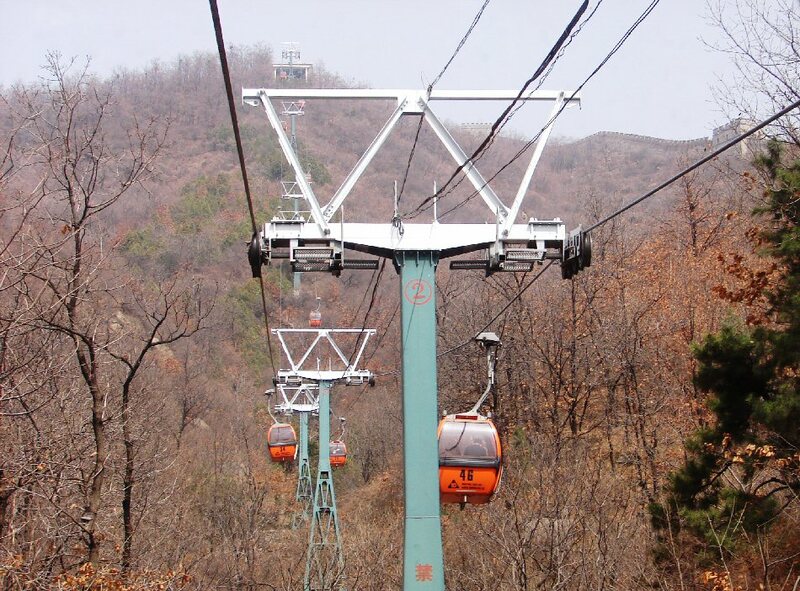 The ride up to the wall on the cable car afforded a view of the wall and treed countryside. There were some more steps but the views and the wall were impressive. Some people walked to the other watchtowers. Some of the able-bodied adventurous people climbed up and then whizzed down on a toboggan. There is also a camel ride available. Interestingly, the wall was built to stop invading armies but it never did. Is there a lesson to be learned from this? On the way back we stopped for a Chinese-style lunch in a very nice alfresco restaurant. Chinese meals are served family-style on a Lazy Susan and everyone helps themselves. The last stop was at a tea shop, and, yup, we could have bought all sorts of tea. Many people did but we did not. 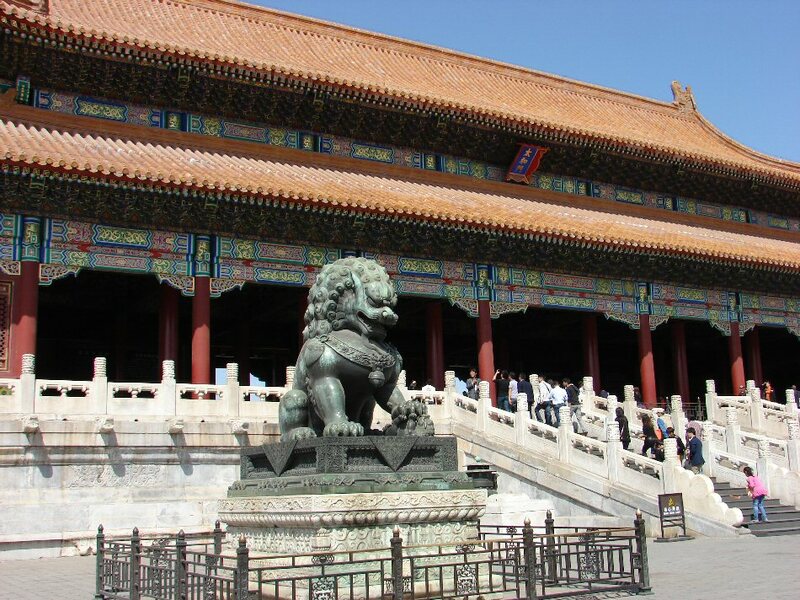 The other must-do in Beijing is visiting the Forbidden City. We visited the last time but it is always impressive. A visit to the Forbidden City. 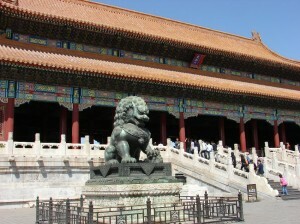 For about 500 years, the Forbidden City was the home of the emperors and closed to the public. Today it is home to the Palace Museum and listed by UNESCO as the largest collection of preserved wooden structures in the world. There are tours, but we just walked from the main entrance through the entire length to the tranquil gardens. Every day there are a lot of visitors. There are guides and audio guides but we just walked slowly and read the signs. A good movie for people planning to visit Beijing is the “The Last Emperor” about Puyi, the last emperor of China. He became emperor when he was two. When the People’s Republic of China was established in 1949, Puyi was imprisoned as a war criminal. When he was finally released, he worked as a gardener and lived as a private citizen. Life has some interesting turns. I never thought I’d visit Beijing – twice. Trivia Tease™: Where in NY is Dreams Park? Look for the answer next week. Sandra and her husband, John, have been exploring the world for decades, always on the lookout for something new and unique to experience. We have sailed down the Nile for a week on a felucca, stayed with the Pesch Indians in La Mosquitia, visited schools in a variety of countries, and — to add balance to our life — stayed at some of the most luxurious hotels in the world. Let the fun continue!